"Being onstage with 11 other singers, creating the most beautiful music that you're able to create for people, kind of teaches you  I don't know if 'poise' is the right word, but it's a kind of humility and a contribution to the world that I tried to kind of incorporate in every aspect of my life." That's countertenor Alan Reinhardt. 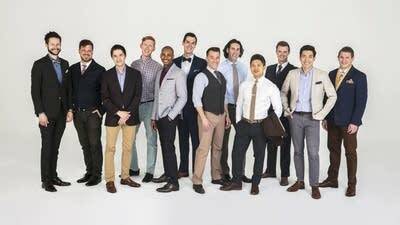 He's been with the all-male ensemble Chanticleer for the past 13 seasons. His colleague, Gerrod Pagenkopf, is also a countertenor and the assistant music director. Both are really excited about the ensemble's 40th anniversary tour which is currently underway. Then and There, Here and Now is a new recording to mark that anniversary, and it also traces the musical history of Chanticleer. Your 40th anniversary recording is really indicative of the ensemble's wide ranging repertoire. Can you talk a little bit about how that repertoire has evolved over the years? "Certainly. This is Gerrod. Chanticleer was founded by a man named Louis Bado who was studying early music at Dominican University here in the Bay Area. He was studying early music and nobody was really performing it and he was interested to know what it would sound like if you took a piece that was written for a choir of men and boys, like the William Byrd Ave Verum Corpus, and what would it sound like if men sang it and not a mixed ensemble of men and women. "In the 90s and 2000s, we were doing things like pop songs and newly commissioned works. Everything under the sun that 12 guys can sing, we do." Joseph Jennings was your music director for 25 years and his specialty was in African-American jazz. He created, what, 100 arrangements or so for the ensemble? Some of those appear on this recording. Could you talk about some of those pieces and why they're so well suited for Chanticleer? (Gerrod) "The two pieces on this recording are Straight Street, which is an old gospel tune, and Keep Your Hand on the Plow, which is a spiritual. I think what makes these pieces so well suited for Chanticleer is that Joe wrote them for specific voices in the ensemble." So, if each of you had to pick one or maybe two favorites that appear on this recording, what would they be and why? (Alan) "I would say the Mason Bates selection is one of the highlights for me. It's just a breath of fresh air to be able to continually sing pieces by him. I've sung now maybe four or five different Mason Bates compositions. Every single one has been a joy." (Gerrod) "I would have to say that my favorite piece on this album is the Steven Stucky Whispers. We just did this piece on our concert in Atlanta a couple of weeks ago, and a woman came up to me afterwards and she said, 'I don't know if Steven Stucky had a near death experience, but I did. I was hospitalized for a time, and there were several times that I slipped in and out of consciousness and I had near death experiences. And when you all sang that Whispers song, that's what I heard." You'll hear many Chanticleer favorites on this new 40th anniversary retrospective. 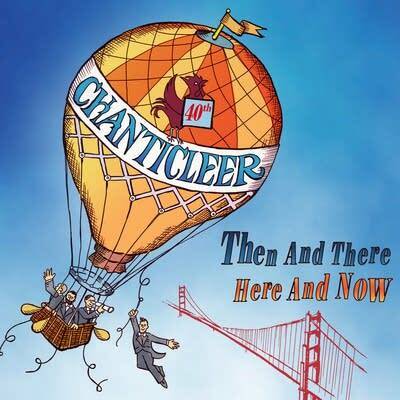 To hear more about Chanticleer and this new release, Then and There, Here and Now, download the extended podcast.